Tuna Pasta is comfort food for me. I grew up eating it on Fridays in Lent when we were out of pizza ingredients. It's a mixture of whatever things you have in the pantry-- all briney in flavor -- thrown over a few cans of tuna and a pound of pasta. It's also the perfect meal when you have last-minute dinner guests, because all of the items can sit on your pantry shelves until go time. 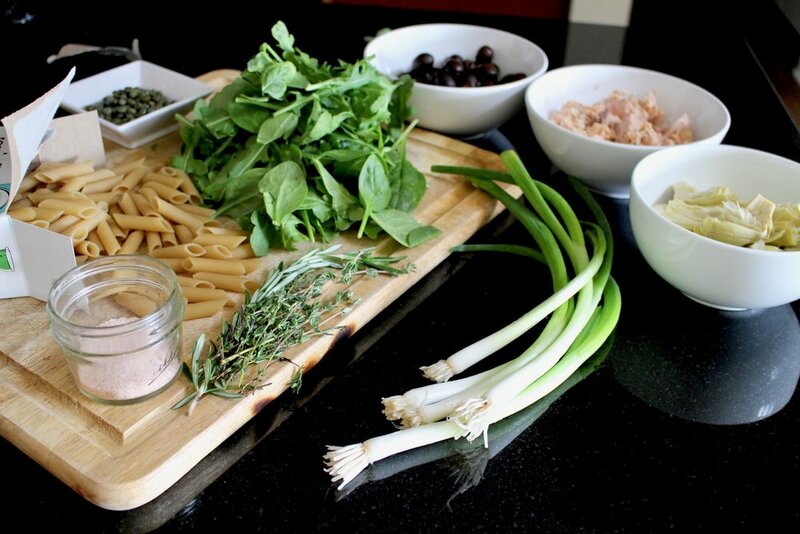 By the time the pasta is cooked, the whole dinner is ready to eat. How easy is that? 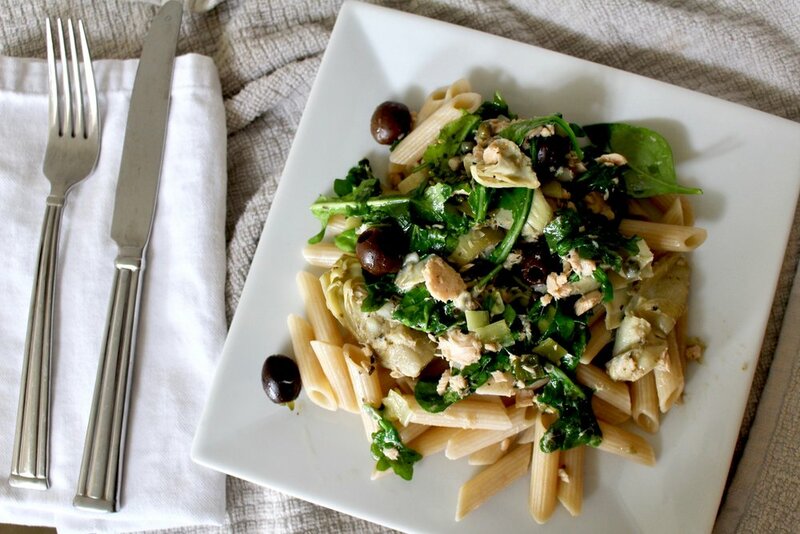 The ingredients I tend to combine are: black olives, capers, quartered artichoke hearts in water, shallots or green onions if you have them, fresh organic arugula and baby spinach, and wild-caught tuna in olive oil. If you have frozen spinach, or even leftover broccoli, toss it in for an added serving of vegetables and a little splash of green. Fresh herbs like parsley and basil are also delicious additions to this dish. There is no science to it. The whole meal is divided in ratios. I don't have specific measurements because that kind of cooking stresses me out, but if you follow the general idea, it will taste good every time. This meal serves 2-4 hungry people. Arrange all of the ingredients on a large surface. Bring the pasta water to a boil and add the pasta in. The Jovial pasta needs 9 minutes to cook. In a medium saucepan, combine all of the ingredients except the greens and salt. Keep the pan on medium to medium high. It just needs a quick cook to soften the onions. When the onions look translucent, turn off the heat, add the greens and taste for salt and pepper. 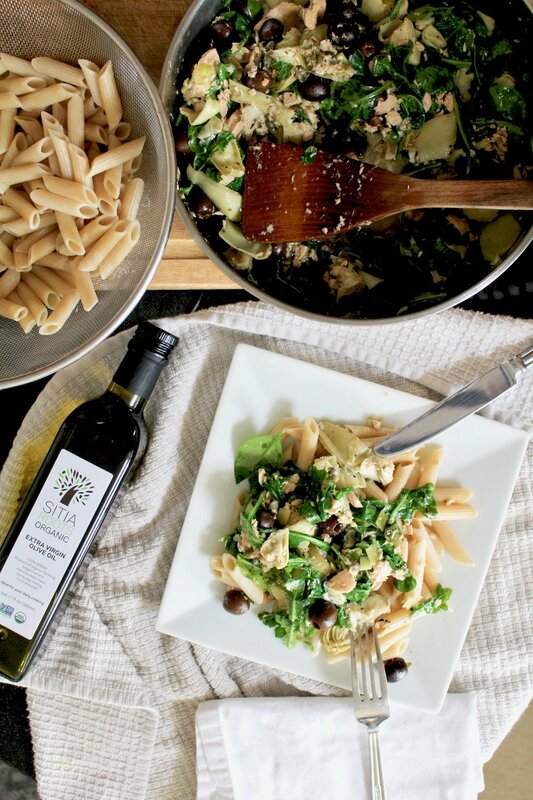 Plate the pasta with a drizzle of high quality olive oil, then add a few spoonfuls of the tuna mixture over top. Drizzle with more olive oil if you like and serve hot, hot, hot! What's your favorite Friday meal? Do you ever eat vegetarian to take a break from meat or save a little on your food budget?